So, you want to try your hand at the art of the pop-up shop? While these here-today-gone-tomorrow shops may seem like the easier alternative to holding down a permanent location, pop-ups present lots of their own challenges. Sure, you’ll only have to run it for a small window of time, but where a permanent shop enjoys the luxury of promoting its new offerings or events over a period of weeks or months, you’ll only have days. A successful pop-up will need to have interested customers through the door and at the till from day one until the end. Luckily, the customer is on your side, with almost half of shoppers gravitating to the exclusive feel of limited time pop-ups, so your main task is to reward their curiosity. Think you have what it takes? Read on for our handy guide on how to start a pop-up shop! Easier said than done! ‘Novelty’ is big business when it comes to pop-up shop ideas – just look at the pop-up mecca that is Boxpark, a venue built out of shipping crates! - so even your most unique idea may not be unique at all when you look at other pop-up creations. This doesn’t mean you need to compromise on your vision, though – a pop-up isn’t just about what you’re selling, it’s about the overall experience. That’s precisely why even major brands like Nike still go for pop-ups, because while their products can be bought in countless shops around the country, pop-ups have that extra magic touch to make a purchase an experience. If you’re offering an experience, you need to find the right place to do it. Boxpark might be an enviable address for pop-ups, but maybe your vision requires you to be the only pop-up on the high-street. Pop-up locations come in all shapes and sizes, from fully-fledged retail units in shopping centres to alcoves in tube stations. Don’t be a hurry to settle for anything less than one that suits your brand. You need an area that gets a good amount of human traffic, which is why Oxford Street, Piccadilly Circus and Covent Garden are the premier locations for big-brand pop-up shop rentals. But maybe your brand is more likely to fit the ‘funkier’ feel of Shoreditch or the more refined tastes of Sloane Square. Whatever you decide, make sure your location, not only geographically but architecturally (if you’re going for cosy or quirky, an industrial warehouse probably isn’t going to work), fits in seamlessly with your idea. You can never do enough marketing for pop-ups - they may not be the most luxuriously fitted-out of stores but punters are usually drawn to pop-ups because of the limited-edition feel they have. People out front with fliers, balloons, banners and attention-grabbing displays may be a bit old-school for well-founded permanent stores, but for the humble pop-up, these things bring the excitement to life. And nibbles and fizz can help get any opening party started. Social media is your friend and a strong Instagram account is a must have for pop-ups who only have a high-street presence for a short period of time. Announce on Facebook and Twitter that you are arriving to the high street, place flyers in neighbouring businesses and put eye-catching posters in the window during your fit out to drum up interest and anticipation. Marketing doesn’t stop once you’re up and running - make sure business cards are available at various points around your pop-up, or ensure staff include one in the bag with every order, your location might only be yours for a few weeks, but every customer might just be yours for a long time yet. Your location is perfect, you have customers waiting at the door, now to make sure you deliver. It can be easy to forget the logistics of store ownership when you are busy trying to grant the fleeting fantasy of your pop-up to every customer who walks in, so you’ll want to have easy-to-use tech on your side. 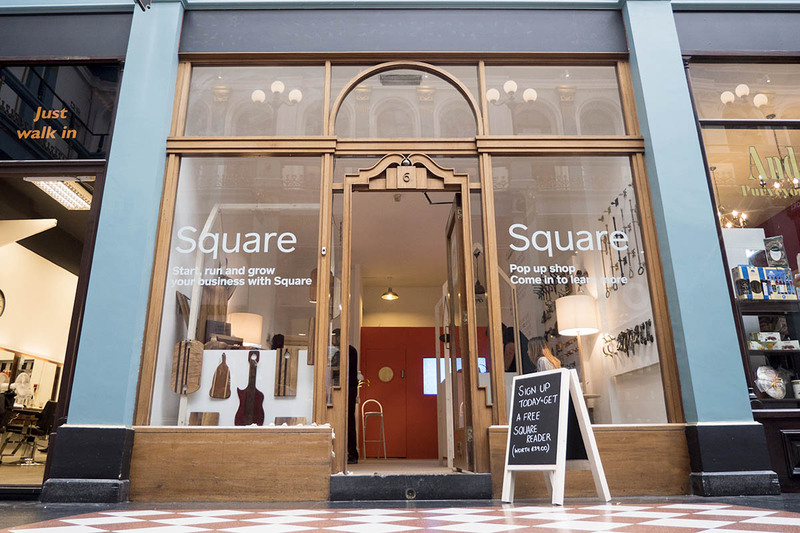 The Square Reader is a pop-up’s best friend, able to accept card payments and digital wallets and letting you manage staff in multiple locations so you’re free to begin your pop-up journey into the British high street wherever you’re ready.